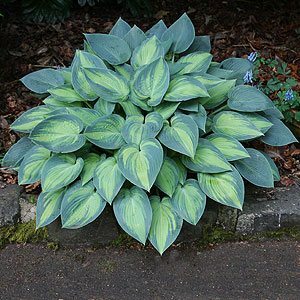 Regarded as a shade loving plant Hosta plants or ‘Plantain lilies’ do in fact like shade, but to grow well they also need a little sun. These great foliage plants are easy care, perfect for a shady border and with around 30 species and countless cultivars available for sale the variety is incredible. Hostas do flower, however they are mainly grown for the foliage. Species and cultivars include, plantaginea, halcyon, blue vision, and Mr Big. Easy to grow and with outstanding foliage, they are originally from Japan, China, and Korea, they grow best in morning sun and afternoon shade. They also grow very well in pots or containers and for many growers this is the preferred method. Planting hostas in a well drained humus rich moist soil in part shade will ensure they will thrive. Protection from the hot afternoon sun is essential. They are best divided every 3-4 years and require fertilising with a liquid seaweed based fertilizer or a slow release fertilizer. Snails and slugs can be a problem, so keep the area around the plants clear. Try some wood ash, dry mulch or sawdust around the plants to deter snails and slugs. Large established clumps of hostas in the garden look fantastic from spring to summer, and when the clumps get real big they can be propagated by division, best carried out during winter dormancy, or late autumn. The best time to buy hostas is in late winter when dormant, ready for planting and making the most of spring growth. ‘Hosta sieboldiana’ is always popular. Minuteman is another popular variety with a medium green foliage with cream margins, from the species Hosta Fortunei. ‘Sum and Substance’ has large green textured heart shaped leaves, an outstanding plant. Hosta Halcyon is another favourite. Hostas do not like hot afternoon sun, nor do they like really deep shade. Filtered light or morning sun, afternoon shade is best for most species. As foliage dies back it is a good idea to ‘clean up’ clumps, remove spent flower heads and old foliage to allow air flow, and to get rid of the hiding places for slugs and snails. Hostas can be divided in early spring, larger clumps can become congested, and in pots they will exhaust the potting mix. They do flower, however it is usually the foliage that they are grown for. Over 350 species & cultivars includes bulbs, perennials, and succulents all available via mail order.